A couple years ago, foster mom Sarah Desjarlais was at a meeting at the downtown Vancouver office of the Department of Social and Health Services where she asked the obvious questions. Turned out, they were children who’d just been removed from the custody of their parents and were heading for foster home placements. It’s routine for such kids to wind up cooling their heels, perhaps for many hours, at the DSHS office, according to Child Protective Services social worker and investigator Kim Karu. Karu would dispute that the kids were “running around” the office, and she described the modest but appropriately child-friendly hangout space there. But she doesn’t dispute that these freshly freaked-out youngsters need a lot more than a TV room. They need the human touch. They need loving reassurance. They need some nurturing. Meanwhile it’s also pretty routine that the social workers charged with finding these kids safe, happy foster placements or developing other painstaking plans for their future must double as babysitters. Not the best use of their professional time, Karu said. They’ve got a million phone calls to make and bases to cover. What they really don’t need, Karu added, is the child sitting right there, audience to all that telephone begging. So when Desjarlais had a basic brainstorm — couldn’t volunteers step in and do the childcare, offering love and comfort and freeing up the professionals to tackle their tasks? — Karu and her managers “welcomed it with open arms,” she said. “We developed this program” called Office Moms, Desjarlais said. It’s an all-volunteer effort that responds to breaking calls for help from the office. When Child Protective Services “is removing a child, they call our coordinator. The coordinator keeps track of all the volunteers and sends out a text blast. `Hey we’ve got two kids coming in an hour, is anybody available?’ It’s really spur of the moment” because that’s the nature of what’s going on at CPS, she said. So far there are about 30 Office Moms in Clark County, Desjarlais said, who are volunteering about 25 hours a month. The idea has spread to Portland, Kelso, Spokane and elsewhere. Desjarlais has launched a formal nonprofit agency called Embrace Washington that includes the Office Moms effort among others — all of which are aimed at supporting DSHS’s social workers through volunteerism and through encouraging more parents to get involved in fostering. Office Moms is a great way to get your feet wet in that arena — or just to do some worthy volunteering at the office, even if you’re not up for taking a child home, Karu said. According to Washington State, there are 8,700 children in “out of home care” here but only about 5,000 licensed foster homes. 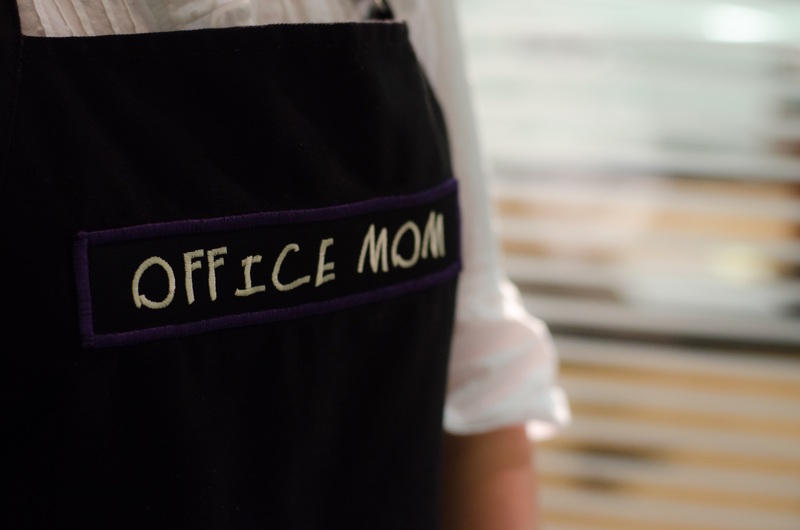 “Office Moms” is a misnomer, by the way. Desjarlais said there’s one Office Dad at present. More are welcome of course. But: “Our target demographic is a housewife who stays home, who has kids at school. Maybe moms whose kids are launched. Or grandmas with a lot of energy. Some of my best Office Moms are Office Grandmas,” she said. Which is just what these roughed-up children need to hear.